As a French citizen, I remember that everybody agreed to say that Jacques Chirac (our former president) was elected for the first time partly because the "guignols", a political and social puppet show very popular in France, made him look very sympathic and funny. I really wonder how much of Barack Obama's success is due to the 24 series' president David Palmer. This is probably impossible to measure, but I would bet my right harm that on all Obama voters, only part of them would have felt like voting for a black candidate only a few years ago. Don't get me wrong, I am very happy about this situation, and other elements (such as war in Irak and the economic crisis) had their impact as well (maybe even more). The point is just that I wonder where entertainment ends and where politics and marketing start. Is Barack Obama an example of product advertising inside a series? Just like Apple and Dell fighting on who will equip the nice guys and who will equip the bad guys. By browsing the web to start finding answers, I found the wikipedia article on President Palmer, mentioning the exact same thing as I just did. A poll by Blockbuster named Palmer as respondents' Favourite On-Screen President. TV.com visitors also named him the TV President they would most like to see in the Oval Office. On an episode of The Daily Show that aired on June 4, 2008, host Jon Stewart pointed out that newly-christened presumptive Democratic nominee Barack Obama will be the first African-American candidate for President of the United States "since the first season of 24." However, this statement is untrue, as David Palmer's brother, also black, ends up becoming president in a more recent season. 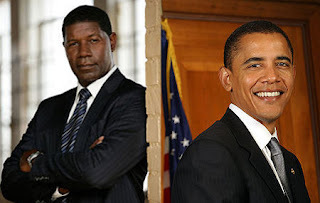 Dennis Haysbert has claimed that his portrayal of David Palmer allowed viewers to become more comfortable with the idea of an African American president, and consequently may have helped Obama's campaign. Anyway, I would like now to congratulate Barack Obama and wish him good luck and success for the 4 (8 maybe ;p) upcoming years. And of course congratulate the American People for this choice that I personally believe to be the right one. And please excuse me for this post that hardly has anything to do with email Marketing.